Will the Higher Education and Research Bill increase student choice? This text was submitted to the Committee stage of the HE Bill ahead of the first meeting on 6 September. Thank you to colleagues who commented. Colleagues are also encouraged to make their own submissions. The deadline for submissions is 18 September, with the first meeting of the Committee on 6 September. 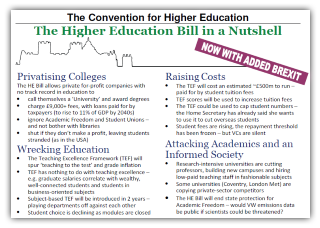 There are two publicly stated professed aims of the HE Bill. These are to increase social mobility and to increase student choice. The HE Bill proposes to increase student choice by making it easier for students to move between institutions during their course of study, and by permitting private providers to enter the sector. This briefing attempts to identify whether the net effect of the HE Bill, in the current context of HE funding policy and the actual behaviour of universities in the face of current funding and legislative frameworks, will be to increase student choice. Note that it is not a given that markets always operate to increase the diversification of offerings, nor is it a given that deregulation increases choice. Currently very few students exercise this option. The Higher Education Statistics Agency recently reported figures available for 2013-14 (the most recent figures available). Out of some 400,000 UK undergraduates, fewer than 7,000 students – below 2% – transferred to another university mid-degree. There are a number of connected reasons why this figure is low and is likely to remain low, irrespective of the intentions of the Government. Academic coherence. Many university courses, by their very nature, are unique to the institution. They are developed by academics working at the frontier of a particular field. An architecture student transferring between one university and another may have been taught in a different way according to different principles. Mathematics curricula differ in the order of presentation of material, and a student who missed precursor modules may require remedial teaching. There is no national curriculum for Higher Education, nor can or should there be. Recruitment conditions. Universities place stringent requirements for application to a course. Given the above, these are unlikely to be reduced for second-year undergraduates. Competition for places. Many university courses are oversubscribed. It is not clear why universities would reduce entry requirements to permit second-year undergraduates to apply. Students who wish to move to an institution with less stringent entry requirements may find it possible, but the opposite is unlikely to be true. Market pressures. All else being equal, it is more attractive for universities to only offer first-year places, compelling a student to restart their degree. A university that recruits a second year undergraduate will only have a guaranteed income of two years’ fees. The student fee-loans scheme does not support extended degree programmes, so restarting the course may be expensive. Moving costs. Where a student has to move city as well as institution this may entail significant costs – which implies that study-at-home undergraduates will be less mobile than wealthier students who can afford independent living. If exercising choice entails substantial costs, this will mitigate against the other professed aim of the Bill, namely social mobility. There is growing evidence that market competition in UK Higher Education is leading to a reduction in student choice. The intensification of market competition that has been generated by the removal of caps on student numbers, and most recently the removal of the tuition fee cap, has in numerous cases led to a reduction in student choices. Proposals to reduce regulation in the HE Bill is likely to increase the tendency towards streamlining and simplification of course offerings. To understand why this is the case we have to consider how students currently exercise choices in relation to their degree programme. 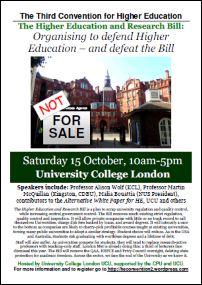 The HE Bill focuses on one choice – the choice of university – at the exclusion of all else. From the perspective of university staff this is somewhat perplexing, as we shall see. As the Green Paper acknowledges (p58), when students apply to university, they face a substantial information asymmetry. They have information from UCAS, university prospectuses and websites, and a number of rating schemes, including the National Student Survey, the Sunday Times Good University Guide, etc. However, with very few exceptions, prospective undergraduate students have no experience of being taught the subject they apply to study at university level. They do not know what to expect. The only way of gaining this information is to begin the course. There have, historically, been a number of different ways in which students have exercised choices during their degree. Flexible honours arrangements. These are curricula where students take multiple optional courses in their first year and make a final decision on their degree subject after their first year examinations. For example, students studying psychology in Nottingham in the 1990s were required to take two additional courses from a choice of mathematics, linguistics or computer science. A student who took psychology, maths and computing could then opt for joint honours in psychology and computing, maths and computing, or psychology and maths. Or they could potentially specialise in psychology, mathematics or computing. However, such courses are less frequently offered today than in the 1990s, although the University of Cambridge still offers a similar system. Where courses are not offered as tripos courses, some joint honours programmes (e.g. psychology and computer science) were designed with the potential to become single honours (psychology or computing). However, the US-style ‘choose your major’ system is uncommon in the UK, and courses have tended to become less flexible over time. Optional modules. The main way students exercise choice is by choosing between ‘non-core’ optional modules. During a course of study, students are offered a range of optional modules which they can gain credit for. Such modules have historically been attractive to students. Students often self-report that the reason they chose a particular university is the potential for working with a particular academic or doing a project or course in a sub-field that appears attractive. Self-defined projects. Many degree programmes, particularly in the final year, require students to carry out projects where the student themselves produces a piece of assessed work. Here ‘student choice’ is exercised directly as a series of academic choices in the type of work that they wish to submit – subject of course to the approval of course supervisors. Note that the range of options available to students above address the barriers to mobility that were identified above. Amongst a co-operating academic faculty, such as co-operating departments in an institution or across the University of London, problems of academic coherence can be addressed. In any case a student does not need to commit to ‘transfer’ to benefit from the range of opportunities offered. Entry requirements are less of a problem if the student and their capabilities are known to their tutors. Indeed the role of the academic tutor, in assisting the student in making informed choices, is, like so much else, missing from the market model envisioned by the HE Bill and the White Paper. Indeed, the fundamental mistake of the HE Bill project concerns how students are conceived of as being spoon-fed consumers (who can ‘switch’ courses like gas suppliers), rather than developing adults in a challenging degree programme, who are learning as much about themselves as the subject matter put before them. Students grow and develop throughout their course. The choices they make are necessarily a result of that development. Unfortunately, market competition has a tendency to narrow choices over time, even if new entrants increase options short-term. There is a growing body of evidence from numerous universities that intensifying market competition is causing university management teams to reduce the options available to students. This is not a recent or unexpected phenomenon, but in some cases it is reaching new levels of severity. Fundamentally, the motivation is to reduce the expense of providing specialist teaching. In the past, institutions have been able to offer many small-scale specialist option modules because research-active academics were highly motivated to teach them, and these staff were already paid for their research output. However, tuition fees have now risen to the point where teaching is much more financially rewarding to the institution than research. Thirty undergraduates paying £9,000 each, taught by a staff member costing £50,000, represents a return on investment of 440%. On the other hand, research is compensated to a fixed Full Economic Cost of 85% of salary costs.2 REF ‘Quality-Related’ income might ameliorate this difference for high-scoring REF institutions, but the pressure to expand general teaching and reduce research expenditure has intensified in every English university. London Metropolitan University was merged from two predecessor institutions, the University of North London and London Guildhall University, in 2002. It has faced increasing competition for students, which has serially intensified with increases in tuition fees. London Met is typical of the ex-polytechnic that was encouraged by governments to broaden and raise aspirations and become a university. As we write in the Alternative White Paper, this sector has delivered on the Government’s Widening Participation agenda, performing what John Holmwood described as “the heavy lifting for social mobility”. Yet, thanks to increased market competition, London Metropolitan University has seen its student numbers fall catastrophically, from 30,000 in 2002 to 13,000 today. Between 2004 and 2015, university accounts show total expenditure halved in real terms.3 The lifting of the cap on student numbers has not altered this trend, with student numbers projected to fall to 10,000. London Met is also important because it is undergoing a severe restructuring in the face of declining fortunes to reposition itself as a proto-private provider. The management strategy, openly stated to staff, is for the university to become streamlined, ‘agile’ and increasingly ‘virtual’. This is leading to the dismissal of large numbers of permanent staff (approximately one third in 2016-17) and their replacement with ultra-casualised (‘zero-hour’), hourly-paid lecturers who, contractually at least, have no guaranteed working hours. Staff in this position are rarely paid for the academic tutoring and mentoring that facilitates informed choices by students. Nor are staff without security of employment in a good position to support a student long-term. Rather, the purpose of the employment condition is in reducing the cost to the employer of providing classroom ‘face time’ with students. This restructuring is devastating to student choice at London Met. ‘Streamlining’ the university inevitably means the reduction of optional courses and modules, and the tendency for courses to become more routine and general. Repeated reductions in staffing over the years have led to serial deletion of courses and modules. Deleted courses tend to be those that are either expensive to teach or are expected to recruit in small numbers. The simplest way to reduce the cost of teaching is to replace small-class teaching with large lectures to many students at once. Other courses are costly for space reasons – Art courses traditionally permit students to have their own space, and Physics courses need labs. Hence, London Metropolitan University closed their campus in Hoxton and sold off the CASS art building last year. In short, the university is doing what many commercial companies do in response to competition: narrowing their portfolio to try to increase economies of scale. London Metropolitan is not alone. The University of Leicester has recently announced a process of ‘institutional transformation’ involving the closure of departments, subject areas and courses, including the Vaughan Centre for Lifelong Learning and the university bookshop. Hundreds of academic, academic-related and support staff are to be made redundant, many compulsorily. Note that whereas London Met is a post-92 university, Leicester is a pre-92 university. The example research-intensive university cited earlier is UCL. The phenomenon of ‘academic streamlining’ is a general problem for the Higher Education sector. What is new is the incentivisation that high tuition fees provides for such streamlining activities. Precisely due to the problem of prospective student information asymmetry, it is relatively easy for university managers to remove optional modules, and even close courses and departments, while still persuading students to attend the university. The student does not know what they have lost because they have never had it. Perhaps the student discovers, on starting college, that an advertised option is no longer available. The calculation is that few are likely to sue as a result. In any case the wise university will have a disclaimer in their prospectus saying that certain courses may or may not be available, or are ‘correct at time of going to press’, etc, which makes it impossible to sue. Having enrolled and possibly relocated, students cannot easily switch institutions if they are dissatisfied, as we have already discussed. Embarking on a course is not like buying a washing machine that lacks the features advertised, such that you can just swap it for another one and demand your money back. This does not mean that there is no student opposition to course closures. The point is it is to be found among existing students and their student union, as the example of London Met students who occupied the CASS building exemplifies. But this opposition is, like Southern train commuters, considered by university management teams simply as a business expense. The question for politicians is whether they are politically prepared to allow students to be treated like this, and for tax payers, whether they should underwrite the fees of a sector that gains a poor reputation as a result. The proposal to reduce regulation and permit new providers to gain University Title and Degree Awarding Powers is addressed elsewhere. Here we are considering the question of student choice. Would a student at a new institution have more choices than is currently offered by existing universities, or will the provider simply offer more places on programmes that are on offer elsewhere? Does the entry of new providers genuinely provide a new set of choices to students? At this point the answer is simply unclear. New providers are bound to claim that they are innovating, but in fact the starting point in terms of currently existed choices is extremely wide: the UCAS website currently lists over 37,000 undergraduate courses at 395 providers. But let us assume that in the short term, as a result of new entrants into the sector, new courses that are not previously offered become available. The question must be what is likely to happen over time. Here we need to look at evidence from other countries, including the USA, that have adopted the deregulated, demand-led model of provision. The evidence is that the type of behaviour illustrated by London Met above is indicative of the priorities of the management teams of many for-profit providers. Indeed the model of ‘virtual’ (distance) teaching is scaled up by the University of Phoenix Arizona into a highly profitable one. Note that this does not mean that all for-profit providers will necessarily replicate an existing model and it is entirely possible that innovation will take place in this sector, just as the existing university sector is capable of innovation. However, the principal point is that quality innovation by the for-profit sector does not require the proposals to deregulate the HE sector that are enshrined in the Bill. Rather, deregulation will tend to encourage behaviour that is conservative and follows an existing tried-and-trusted model, and which prioritises marketing over teaching quality. Indeed, some existing for-profit providers have expressed concern that deregulation will in practice lead to a reduction in quality by new alternative providers who are not subject to the same regulation that they were required to go through. In this context it is worth re-examining proposals for changing the regulatory structure of the sector in the Higher Education and Research Bill. One set of proposals concerns ‘market exit’. Currently, universities are obliged by contract to continue to teach students who have been recruited if their course closes. Thus the University of Leicester must find a way of teaching the second and third-year undergraduates in departments that no longer exist. This process, termed ‘teaching-out’, was called into question by the Green Paper. Even were this a mandatory rather than optional requirement, this wording falls short of a binding commitment by the institution to teach the course to completion. Yet this commitment is currently required of all universities. Such commitments do two things: they guarantee the course offered to the student is still available even if it is closed to new entrants, and they have the effect of stabilising the market. Reducing the cost of cutting courses is likely to have the effect of encouraging more rapid ‘streamlining’ exercises and increasing market volatility. seeking support from the OfS to place students at another university. The interpretation of Clause 15 is left to secondary legislation, yet again, clarity on this process is precisely what students require. Nor does there appear to be any provision in the Bill for students to seek compensation for the failure of a regulated provider to teach their course to completion. Further ambiguity concerns the definition of what would it mean to “teach a course to completion”. Currently in practice this means providing the necessary teaching and permitting the student to graduate (subject to examination) with a degree in the subject for which they applied. For example, the closure of the Department of Linguistics in Nottingham in the early 1990s meant that students whose subject was defined in terms of a compulsory linguistics component were taught to completion (with staff housed in the Computing Centre), whereas new undergraduates were offered courses which did not contain this component (and were renamed accordingly). This returns us to the importance of the regulation of standards and content of degree programmes for protecting student interests, and why the abolition of the QAA and replacement by the OfS is not without risk. This might suffice were the OfS equipped to address the question in a competent manner with appropriately punitive powers to punish abuses under Clause 15. However, the term “standards” is used in two very distinct ways in the Bill. Clauses 23 and 24 relate to standards which could be construed as subject-related academic standards (i.e. where subject-dependent expertise is relied upon), which might inform decisions to trigger compensation and penalties, whereas clause 25 implies that the standard is merely a rating on a scale for the entire university. This is the same conflation that the TEF engages in. However, whereas the TEF may end up being merely wasteful and largely irrelevant to quality measures, the inability of the OfS to intervene forcefully with fines and rescue packages when a provider closes a course will lead students stranded. Light initial regulation shifts the regulatory burden on punishing subsequent breaches. The lack of clarity in the Bill on how such breaches will be identified and how they will be addressed seems to call the entire exercise into question. Stranded students are not a feature of the UK Higher Education sector, precisely because universities are obliged to teach courses to completion. MPs should look overseas to see what can go wrong. The situation facing 110,000 US Corinthian Colleges students, who were stranded mid-course, degree-less and indebted last year, represents a stark illustration of the risks of relying on Higher Education providers to regulate themselves. This entry was posted in HE BIll and tagged alternative providers, NUS, privatisation, student choice, students, university. Bookmark the permalink.